If you are looking for a great way to advertise your business and grab the attention of passers by, then a printed pavement sign/ A-board is for you! 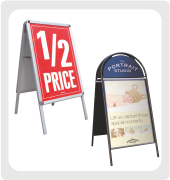 At Bath Signs Digital we can supply a wide selection of pavement signs/ a-boards, suitable for almost any retail environment and budget. Having a pavement signed placed outside of your business is a great way to increase your walk in traffic, promote specific products/ services and inform people of upcoming events. We have options for different graphic types such as interchangeable poster displays, chalkboard panel displays for you to write your own messages and fixed panel display pavement signs. 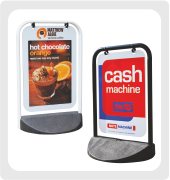 All pavement signs/ a-boards can be sold with or without printed graphics/ poster inserts. 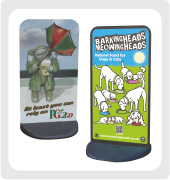 All of our pavement signs and A-boards are supplied direct from a top UK manufacturer and we print all of the PVC poster inserts, panels etc in house using our top of the range Mutoh and Roland print machines. To order any of our products please call us on 01225 422688. You can also email your enquiry to emily@bathsignsdigital.co.uk.